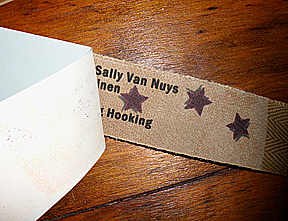 I have been making these labels on binding tape for my rugs for years. You can bind your rug and add your label all at the same time. Save some time and they look great. 1. Create your label on your computer in a graphics program like Paintshop, or with an online graphics application like SumoPaint.com, or whatever program you normally use. I use Photoshop, so the photo of my screen below shows that program open with my label graphic file open. Create a document that is no taller than the width of you binding tape – you’ll want to space above and below the text. Add your name, date, and location and any other information you want to have on your label. You can even add a graphic if you like. When you have it exactly as you want it, Save it, and then flip it horizontally so the text is backwards. 2. Copy the image so you have several on the page if you want to label more than one rug – otherwise, don’t print more than you will use right away. The fabric transfer material does not work well if it has been sitting open to the air for very long. 3. You might want to print out a test page on plain printer paper first to be sure it will fit well on your binding tape. Make any adjustments needed. 4. Read the instructions that came with your transfer material then print the label. It should be backwards on the paper. 5. Cut the label carefully from the sheet and trim so it fits on the binding tape. 6. Again, refer to your transfer paper instructions, but generally, you want a hard surface that is low enough onto which you can lean all your weight forward. I use my worktable and I put a piece of scrap wood down to protect it. You can use a wooden cutting board or something else that is smooth, hard, and cab withstand the heat of your iron. 7. Put your binding tape on the wood, lay your label face down onto the binding tape, allowing enough space on either side of the label to turn under the cut edges of the binding tape (if you are making a separate label.) 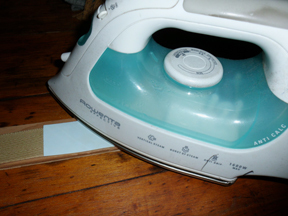 If you are ironing the label onto the long piece of tape you will use to bind your rug, make sure you know where to place the label so it will be positioned in the correct place when you bind it to the rug. Sit the iron (no steam setting) in one spot on the label, lean on it with all your weight for about 10-15 seconds, and then move the iron to the next spot. Repeat until you have ironed the entire label – pay close attention to the edges. 7. I find the paper peels of easier if I don’t allow it to cool completely. I wait until it is cool enough to handle, start at one end, and slowly peel the paper backing away from the transfer just a bit. Be sure that the lines are all transferred. If not, replace the paper and iron some more. All is transferred, slowly peel all the paper backing off. Allow the transfer to cool completely. 8. Now you can either hand sew the label to the back of your rug, or attach the binding tape to the back of the rug as you whip stitch the edges – all at once. And that’s it! 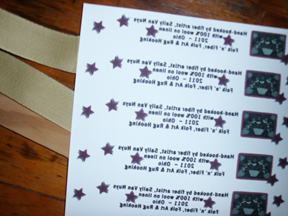 Give it a try – I think you will love the way these look and you can make the label as long as you want – just keep transferring to the length of your binding tape! Love this idea! Your website is great and I will be visiting alot! Thanks for the nice words. The rug labels are really easy to make and since you have to bind your rug anyway, may as well save some time and bind & label at the same time, right? What a wonderful idea! I know I am going to do this on my next rug!! Thanks Karen – it’s really easy as long as you press really hard and use a board underneath the tape. Jusat lift a corner to check the transfer before you comp,etely peel it off the tape. If it’s not transferred well, you can just put the corner back down and go at it some more with your iron. 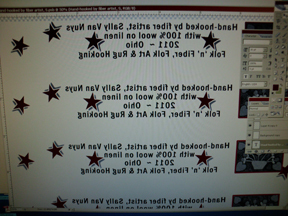 I think this is much better than the way I have been doing it (printing it on fabric covered freezer paper sheets. I love the idea of using rug binding tape. Thank you so much! I must give this a try!! Thank you for sharing!